But here’s how Mueller got those emails, according to the picture of events emerging on Sunday: According to CNN, he simply asked the General Services Administration, which hosted the .gov domain on which the emails were stored, to hand them over. In a seven-page letter to congressional committee leadership, BuzzFeed News reported, Trump lawyer Kory Langhofer accused the GSA of lying to the transition team about who would handle future requests for the production of records and said they included privileged information. But GSA Deputy Counsel Lenny Loewentritt told the site in a statement that the transition team officials were explicitly told that “in using our devices,” any materials stored therein “would not be held back in any law enforcement” requests. In other words, the transition team geniuses apparently did not consider the possibility that federal investigators could easily obtain emails they sent on federal government systems. On whether Mueller should have disclosed that they had obtained the emails, Loewentritt added, “That’s between the Special Counsel and the transition team.” While Trump’s team has insisted that former GSA general counsel Richard Beckler had assured them that they “owned and controlled” the emails, BuzzFeed wrote, Loewentritt disputed that account and Beckler has since died. 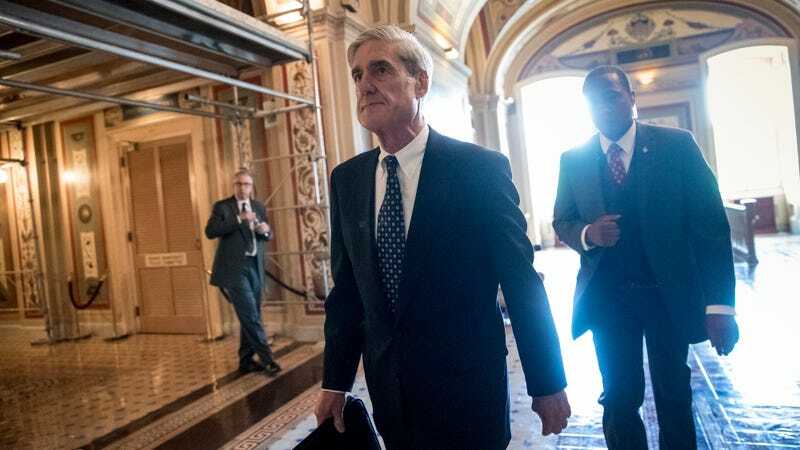 “When we have obtained emails in the course of our ongoing criminal investigation, we have secured either the account owner’s consent or appropriate criminal process,” Mueller spokesman Peter Carr told CNN. In addition to the emails, CNN reported, Mueller’s team was also able to secure access to “transition laptops, cell phones and at least one iPad” without a subpoena. It’s pretty likely that agents involved in the investigation chose to pursue the emails under the radar so that they could surprise witnesses and other persons of interest in the investigation with questions—or they were skeptical that the Trump team would actually transfer over all of the emails. While there’s nothing yet to indicate whether there was anything explosive in those emails, the administration is clearly spooked. Claims of illegal behavior by Mueller might be used as a pretext for the Trump administration to attempt to fire him, the New York Times reported, though the White House publicly denies that is under consideration. Either way, this is yet another reminder that if you’re under federal investigation, you should probably assume they can get anything you wrote through a .gov email pretty easily.